I just cannot believe that the year is almost over. All sorts of January 1, 2011 resolutions have turned into nothing more than just good intentions. Let’s see… I was going to lose twenty to thirty pounds by 2012, oh-oh, I had better get started! I am sitting here at my computer listening to George Winston’s superb piano playing, I have my Fresh Frasier Fir scented wax melts brewing on my coffee cup warmer, and I am looking out of my window at a gloriously gloomy-looking day. It looks like it should be a crisp and cold December day outside, rather than the high-in-the 70* type of day that it is expected to be. I am reading Marion Babson‘s The Twelve Deaths of Christmas, and am enjoying it a lot so far. When I first started this mystery, I kept thinking I had read it before. It was published in 1979, so it has been around for a while. But as I progressed, I found that it wasn’t quite as familiar as it would have been, had I read it before. Then it dawned on me: Because you get to “hear” from the actual murderer (some of the chapters are first person narratives), I was thinking of Simon Brett‘s A Nice Class of Corpse, which is another mystery book I really enjoyed. I have so many things I should be doing right now, but here I sit, procrastinating AGAIN. I have a few things I absolutely have to get done today, of which, making a January 1, 2012 Resolution List is not! I just got an email that P.D. James’ Death Comes to Pemberley will be available for Kindle on Dec. 6. I don’t know when it was released in England but I’ve seen some reviews that are all over the map, either people love it or hate it. I like P.D. James’ Adam Dalgliesh mysteries but I don’t consider them cozies. I think most historical mysteries are cozies and after I read this one (I’m also a Janeite) will report on my impression of it. Happy December to you, too Danna. Hope this past year has been good for you. Here’s hoping this Christmas season is one that you will remember . Hope, that is what Christmas is all about. Hope that a better life is ahead and waiting for all of us who believe! Reading….ah….if only I had the time. I’d love to curl up with a good book, a cup of hot chocolate and staying warm in my jammies, but for some reason these past few weeks have been extra busy. I’m supposed to write my new book next month, which means nothing else will happen. I’ll be holed up in my studio across the lawn from our home….but oh that walk (200ft) on a cold frosty morning is not something I look forward to. This year I had planned to write in October, but it didn’t happen. So I envy those of you who are reading a good book right now. My studio which itself is pretty chilly right now, is about half a mile from my home and involves a drive. I get packages delivered there because here I have a rural mailbox and even though it locks, it isn’t secure enough and the current UPS guy doesn’t like to call for me to open the gate so he can drive up to the house. I also keep the studio because I have tons of art supplies and my glass working equipment. I just finished reading the two latest David Handler mysteries and am currently well into Ann Purser’s Threats At Three and have pre-ordered Foul Play At Four which will also be released on the 6th. That seems to be a popular date for releasing quite a number of books. I’m reading in between baking projects. Some things don’t give me much time but currently I’m baking some banana nut breads that require a minimum of an hour in the oven as the batter starts out very wet. Andie, banana nut bread sounds great to me! My husband doesn’t like nuts in any of the food he eats, although he does like nuts. He says it’s the texture that bothers him. So, when I make cookies that absolutely, positively REQUIRE nuts (as in all of the cookies the rest of us like!) I take out a portion of the dough before adding the delicious, nutritious nuts. I started a book by Frank Tuttle (fantasy) and it’s pretty good. It’s not his usual Markhat detective character. It’s about a woman who is a witch (a good one) who has a lot of tasks and a talking plant. I really enjoy the plant. Maybe because I’m a gardener! 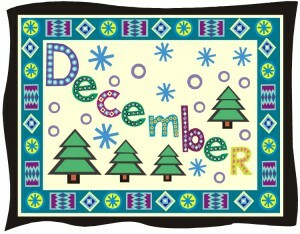 Enjoy December and don’t blink or it will be gone! Hi! I was thinking about New Year’s resolutions recently (of course) and even though I don’t meet most of them, just starting a new year gives me a little bit of a high. Maybe it is the hope factor. So, I will be setting resolutions again and maybe some day, I will meet one of them. Who knows? Hope everlasting makes life worth living. The best to you all with your resolutions! We can hope and dream, Annie S. >>> I will keep making my yearly resolution to lose weight, and who knows! Happy December to you. Counting the days until Christmas Break or rather Winter Break which is what they call it now.I should be doing something like tidy up the screened porch but I have been reading instead. Just finished Explosive Eighteen by Evanovich and am now reading Three-Day Town by Margaret Maron. As for New Year’s Resolutions for 2012 I decided to make one I could keep – read as much as possible. I’m right there with you, Denise, Re: counting the days until Chr… er… Winter Break. Love your New Year’s 2012 resolution! I just have to tell you something about the book I am reading – A Killer’s Christmas in Wales by Elizabeth Duncan. Sometimes authors put bits of info into a book, and the reader may or may not catch the significance (or irony) of it. Since I am a voracious reader, I happen to ‘catch’ this one. To be brief – the lead character (Penny) owns a manicure shop. A woman with an American midwest accent comes in for a manicure. Her name is Dorothy Martin. I didn’t catch on just yet – UNTIL they were talking about a recent murder and ‘Dorothy’ said she has had some experience solving mysteries. I thought, “wait a minute – this is awfully familiar!! !” Sure enough a few paragraphs later ‘Dorothy’ said she married constable ‘Alan’. If you read a lot of cozy mysteries you’d realize this is the character Jeanne Dams writes about in her books. The Dorothy Martin series is also set in England. Elizabeth Duncan is a Canadian writer and I know Jeanne Dams lives in South Bend, IN. I’m not sure how their paths crossed, but I’d think an author would need to get permission from another author to use a character in their book (which most likely isn’t difficult to get). Since I am only half way through the book, I don’t know if the Dorothy Martin character appears again in this storyline. However, I was anxious to post this to tell you about it. Dorothy Martin only makes the one appearance in the book (although Penny thinks about their encounter later in the book). I read somewhere that the two authors arranged this and that we should look for a guest appearance in the next Dorothy Martin book. I don’t know where they met up, but they were both at Malice Domestic this year and are scheduled to attend again next year. If you ever get a chance to attend Malice Domestic, do so. It is a wonderful convention for the cozy fan. I’m just sorry I didn’t start going years ago! Thank you for telling us about this “cross-over” between Elizabeth J. Duncan and Jeanne M. Dams, MJ. This will add a lot of fun to those of us Cozy Mystery readers who read both the Penny Brannigan and the Dorothy Martin mystery series. Judith, I don’t think you can get cozier than Malice Domestic. When they announce their Agatha Award nominees and winners, I always take a good long look at them. Have fun in May 2012! I just finished reading “A Christmas Odyssey” by Anne Perry. What a bloody, gory book. If this hadn’t had a Christmas them, this book would have been okay. But it was just too gory for a Christmas book. This was just another version of the prodigal son to me. As a matter of fact, where I love the Christmas murder mysteries most of the ones I picked up this year have just been too gory for me. I decided to just give up on the Christmas gore and go back to reading just the plain gory book. Yuk, huh?. Linda, I enjoy truly Cozy Mystery books during the holidays… well, actually, all of the time! Danna, I have found some Christmas cozy murder mysteries that have been just terrific reads. I guess I just needed to look a little harder. I did see that Anne Perry has other Christmas books out. Are all of her books the same sort of story? I was not sure if everyone was aware of the two new books on Agatha Christie just recently released. The first is John Curran’s “Agatha Christie: Murder in the Making” the follow up of the 2010 “Secret Note Books” and the second “Agatha Christie: An Autobiography” which includes a CD with commentary from Christie herself. I also read that 80 of her books have been repackaged in paperback to be released in 2012! I read the first Curran book on Christie, enjoyed it a lot but it may be a bit dry for those who are not as avid about Agatha as I am. Looking forward to reading the second one, it’s supposed to be organized chronologically so I think that it will be an easier read than the first. She’s still a fascinating writer, thirty some years after her passing! And I will be collecting all the *new* paperbacks that I can afford! I love to try the newest series. I was wondering if you could or would consider setting up a link in your new releases section that was just for new series so that it is easier to find them. Thank you so much for this wonderful site! Mr. Cozy, this looks like an interesting idea. I just went through each of the mystery book new releases entries on the Mystery Book New Releases page, and made the word “NEW” in bold, so that it will be easy to see which of the authors are putting out new mystery series each month. I have made a New Year’s resolution that I am going to pick up at least one Agatha Christie book each time I go to the library. Hopefully I can read them all. Linda, Agatha Christie is one author your library probably has a lot of. Good choice in authors, and good New Year’s resolution!